Penllyn Castle, four miles south-east of Bridgend, was probably built by Robert Norris, Earl Robert of Gloucester's sheriff. Lord of Penllyn by 1135, he seems to have erected one of the first Norman keeps in Glamorgan. It was an oblong tower, like contemporary Ogmore. The two surviving walls stand on the edge of a low cliff above the River Thaw. Near the base are six courses of 'herringbone' masonry, a feature of early Norman work in which the stones are set in alternate diagonal layers. Above are traces of a blocked first-floor entrance. The keep now forms one corner of a derelict building. This began as a Tudor manor house of the Turbeville family, but was converted to a stable when the adjacent mansion replaced in in the 1790s. Adrian Pettifer has a degree in Ancient and Medieval History from the University of Birmingham, and has long been a keen visitor of historic monuments, concentrating primarily on castles, abbeys, churches and ancient sites. 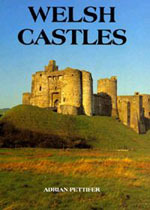 He is the author of English Castles (1995) and Welsh Castles (2000), published by Boydell and Brewer, gazetteers intended to provide a concise history and description of every masonry castle and the more substantial earthworks. He can be reached via e-mail at: AdrianPettifer@msn.com.